Similar to our Guatemalan adventures, our springtime visit to Norway featured its fair share of last minute planning. But just because we were on a tight deadline didn’t mean we skipped out on our tendency to do excessive amounts of pre-trip research. In fact we discovered a number of immensely useful travel blogs (thanks to the social media influencer economy I guess?) that steered us in the direction of a triangular journey across Norway via plane, train, automobile, and boat. We started with a nonstop flight into Bergen for a few days before catching the Hurtigruten cruise ship/ferry line for the overnight journey to beautiful and remote (by New York City standards) Ålesund. We finished off the third leg with train from nearby Andalnes into Oslo. In total it was a marvelous week-plus as we encountered a delightful mix of the scenic (waterfalls galore in late May post snow melt) and the cultural (the cuisine in particular exceeded our expectations). In fact there are only a few minor tweaks we would have made even with perfect hindsight - including an extra day in Oslo which was rocking during our short visit. 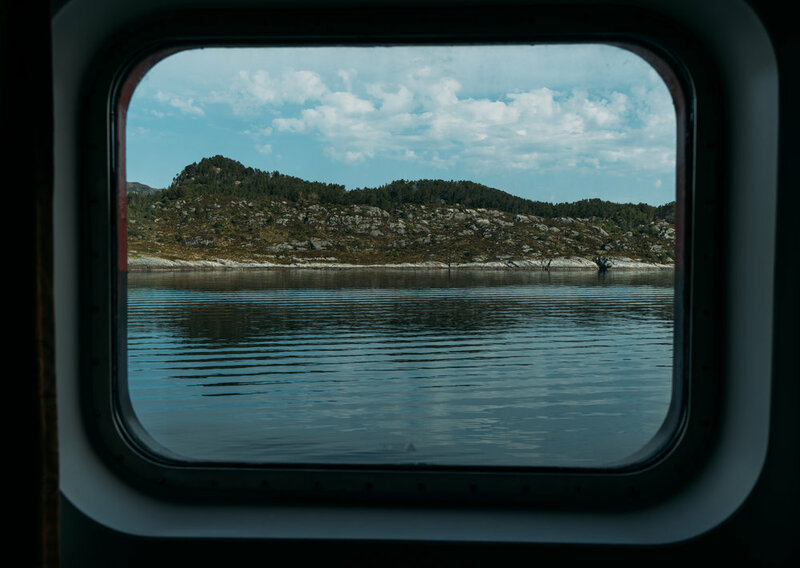 But with those lessons in mind and a whole bunch of excellent photographs to share, we’re bringing a three part recap of what to see and do in Norway to the To Be Determined Journal. Side Note: this is one of our least cycling centric destinations pieces. We thought about bringing/renting bikes, particularly in the Northern stretches of our journey where the roads were spectacular (when not clogged with camper vans as would have been the case in summer) but with limited time on our hands we traveled by car, ship, and train rather than by bike. Our biggest debate for this trip was without a doubt the best time to visit Norway. We settled on late May in hopes of beating the crowds and were generally successful in doing so: with only a few exceptions most of our trip felt like we were totally beating the summer rush of tourists. But the second biggest debate was how to split our time between Bergen, Ålesund, and Oslo. Eventually we settled on allocating ~2.5 days in Bergen (arriving Friday morning and departing on the 10PM Sunday evening ferry cruise), 3 full days and two half days in Ålesund and 1.5 days in Oslo. Unfortunately that final stop in Oslo felt too short in hindsight, so if we had to shift anything in our trip we would probably have moved one day away from Bergen in favor of Olso (or just extended our trip for an extra day). Our time in Bergen happened to overlap with both the Champions League final and the presence of one or more UK cruise ships docking overnight in town. Combine these two and we encountered a plethora of loud (first with anticipation, then with sadness) Liverpool supporters, often times shirtless, overflowing out of any number of harbor-side drinking establishments. I wouldn’t say this was particularly additive to our experience in Bergen. But given the size of the city (just 280,000 residents) and the scale of the tourist trade (more than 500,000 annual visits from cruise ships alone) we had the sense that Bergen’s culture and history are prone to being overwhelmed by the tourist trade. Perhaps this fueled our preference, in hindsight, to allocate more time to Oslo and less to Bergen, but we still had a great time wandering the old waterfront streets and the Bryggen area. Our stay also happened to overlap with a day of celebration for one of the Norwegian youth organizations - leading to a number of marches throughout the city amidst the beat of competing drums (below left). But otherwise our time in Bergen was mostly comprised of wandering the old city streets. Our AirBNB, located on Krybbesmauet near the Fløyen entrance, was the perfect launching pad to explore the history of the city including the harborfront fish market and the old buildings that comprise Bryggen (an UNESCO World Heritage site). 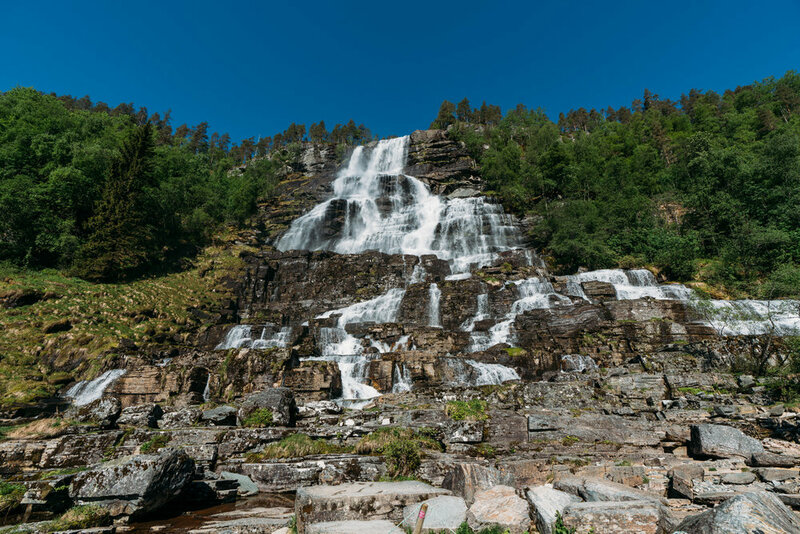 Each of these visits were quick stops, so our in town adventuring was more of the ‘sum of the parts’ than any single activity that is a must-do (outside of the Fløyen, which is ideally captured at sunset). Do note that if you visit in summer, near the solstice, not only will you need to come armed with eyeshades, but there are many young people out until all hours of the night in the old town and with no air conditioning in most buildings you may want to be prepared with ear plugs or headphones as well! A small price to pay for the experience of staying out until midnight with near perfect light and the longest lasting - and gorgeous - sunsets. But we did lose sleep on one night due to the late night partying nearby. From there we continued East, leaving the main road to take in the switchbacks on the (one-way only) Stalheimskleiva road. One of the steepest roads in Northern Europe, Stalheimskleiva maxes out at a 20 percent gradient and is known for its views of the the Stalheimsfossen. Though for our money, one of the adjacent falls - we believe the Sivle fall - was more impressive during our visit. There were several walkways and viewing points under construction during our visit and they provided an incredible view, complete with a remarkable rainbow, and all without another human in sight. From that scenic diversion, we returned to the E16 and continued East until we ventured up the small 601 roadway for a waterfront lunch and pitstop in the tiny town of Undredal (population 112). Known for the smallest stave church in Northern Europe and for the production of brown goat cheese (I wasn’t a huge fan, but its worth trying and reading more about the production process) this made for a most excellent turnaround point as we looked to avoid the crowds that pile into Flam. In fact, save for a few fellow tourists partaking in a guided kayak tour, we were seemingly the only visitors in town during our stay. We enjoyed a quaint and rustic Norwegian lunch right along the bank of the bend in the Nærøyfjord with unbeatable views and near solitude. We mostly followed the same route on the return trip to Bergen, only skipping the detour through Stalheimskleiva pictured above in favor of time savings on E16. But the view for much of the drive was just as remarkable in reverse and we found ourselves stopping on multiple occasions to snap a few pictures or venture down to lakeside campgrounds. Fair warning: given the number of stops and side detours we made on this day trip, most of them without another tourist in sight, it may have been a different experience on one of the number of ‘Norway in a Nutshell’ buses that we saw on the drive. 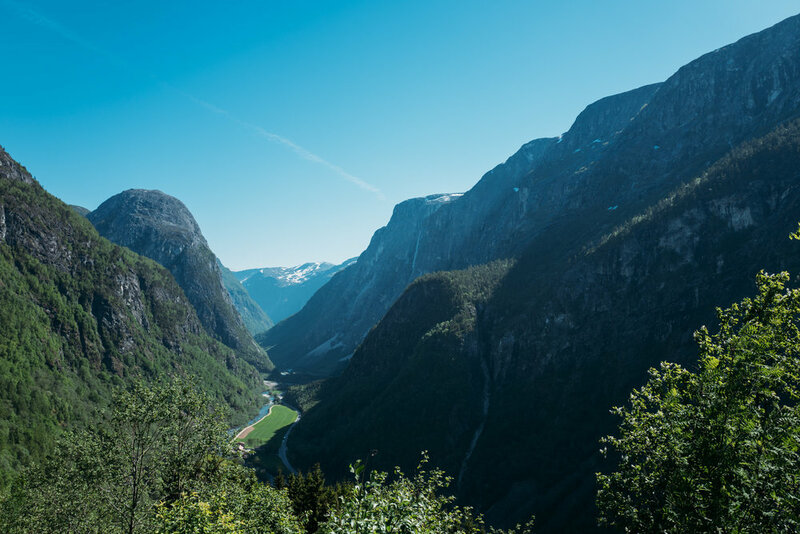 But particularly if you are open to renting a car in Bergen we highly recommend jumping behind the wheel and heading to the Nærøyfjord (check out the Google Map at the bottom of the page for additional detail on the drive). Bare Vestland - topping our list of restaurants in Bergen, Bare Vestland’s Norwegian tapas menu was our favorite of the trip and unlike our 2nd choice (below) it had the service to match the quality of the cuisine. The menu changes seasonally so it’s hard for us to make specific recommendations that will be available consistently throughout the year but the Pork Belly and flatbread were most excellent during our visit. Definitely worth a stop if you’re looking for casual dining in the harbor area. They also take online reservations which can make pre-planning especially during peak times most convenient. Lysverket - one of those tales of two parts, the food at Lysverket was excellent - one of our favorites in Bergen without a doubt. Unfortunately, the service was also one of the worst despite a not-quite full dining room. In fact just getting our server’s attention to pay the bill was challenging, though it seemed specific to our server and we feel comfortable leaving this one relatively high on our recommendation list. The menu has evolved since our meal, but just about every dish was a winner with the fried cod as one of the standouts. Nama Sushi - we stumbled upon this modern sushi joint near our Airbnb and unexpectedly had a great sushi lunch including some favorites of wagyu maki, scallop ceviche and spicy edamame. It’s a nice quiet find at lunch especially given the nearby crowds. Bryggen Tracteursted - our first meal in Bergen was a casual lunch at Bryggen Tracteursted featuring cold beers to help recover from the long(ish) flight from New York City on a cramped 737. Dining outside under blue skies the food was pretty excellent from start to finish, even if it was pricey given the portion and setting (something that could be said for any number of our meals given the cost of eating out in Norway). But for our opening lunch after an overnight flight it was pretty much perfect. Enhjorningen - housed in a building dating to 1702 with roots going back as far as 1260, we had a generally good meal at Enhjorningen. Perhaps fitting given the age of the building, the atmosphere is about as far from modern as you can get but all of our seafood dishes were tasty enough to leave a positive impression on a somewhat staid dining experience. Det Lille Kaffekompaniet - while not a food specific joint, this cute and quaint coffee shop made for a nice pit stop before exploring the city complete with great coffee (the coffee culture in Norway is on point) and pretty baked treats. Our final moments in Bergen provided one final highlight, perhaps the most memorable of our entire Norwegian trip. 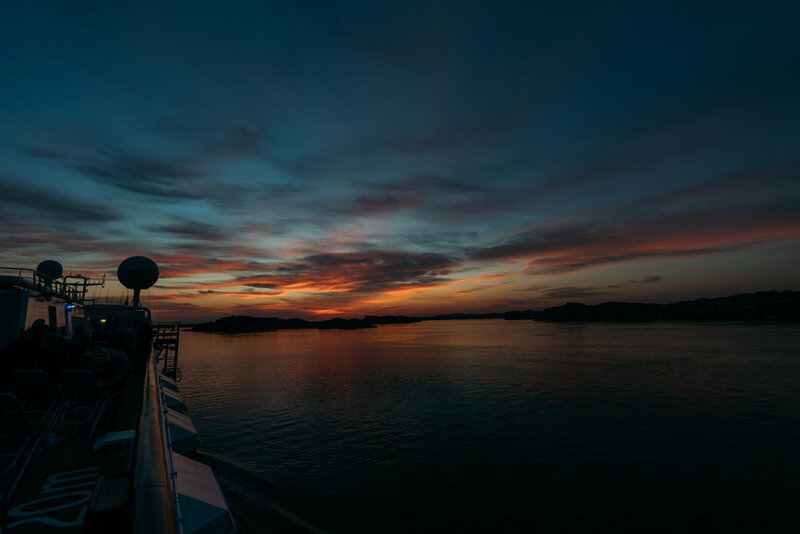 Because we boarded the Hurtigruten cruise ship shortly before 10PM for an evening departure we were treated to an absolutely spectacular sunset as we left the dock and headed through smooth, protected waterways on the way North toward Ålesund. In all honesty the photographs hardly do justice to just how beautiful this sunset was. Staying by the waterfront is an ideal location for easily walking to the Fish Market, Bryggen, the Floyen, as well as bars and restaurants along the harbor. Do note though that in summer months people tend to stay out late with the barely setting sun and combined with lack of AC in most older buildings (assuming you go the AirBNB route rather than some of the various larger hotels in the area), it could make for noisier nights - just bring ear plugs and eye shades to compensate. Floyen has a great app that allows you to check on funicular times and book tickets on the fly, which if you are visiting during peak months, you will understand why this is key. Even slightly ahead of peak season the lines to purchase tickets were massive during the middle of the day. Save yourself the hassle and buy tickets via the app. Rent a car and drive on your own to one - or more - of the nearby fjord networks! Use Norway in a Nutshell as a great guide and tool for planning your general route but then make pit stops off the beaten path as much as possible. I can’t imagine our trip to the fjords would have been anything near as memorable without being able to stop on command when we saw something intriguing or having to line up for pictures of a crowded viewpoint. 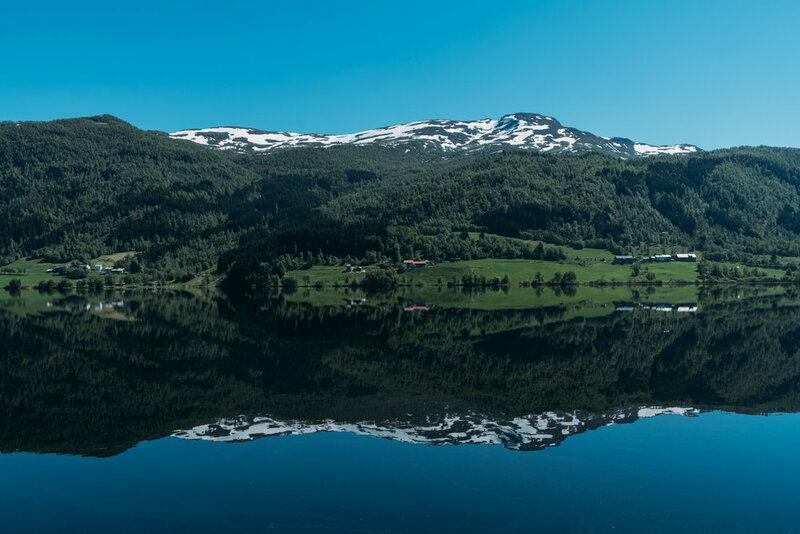 Norway has a vast network of tourist roads, deemed as particularly scenic and extraordinarily well maintained routes - complete with architecturally modern rest stops - throughout the country. If you visit on the edges of the peak season, make sure to consult road closures ahead of time to know which roads will be open during your visit. Parking is at a minimum in the city, so if you do rent a car, make sure to plan ahead for a parking or garage space once you return from your journey. Most car rentals in town will be closed before you want to return, so picking up and returning in one day can be a bit complicated. 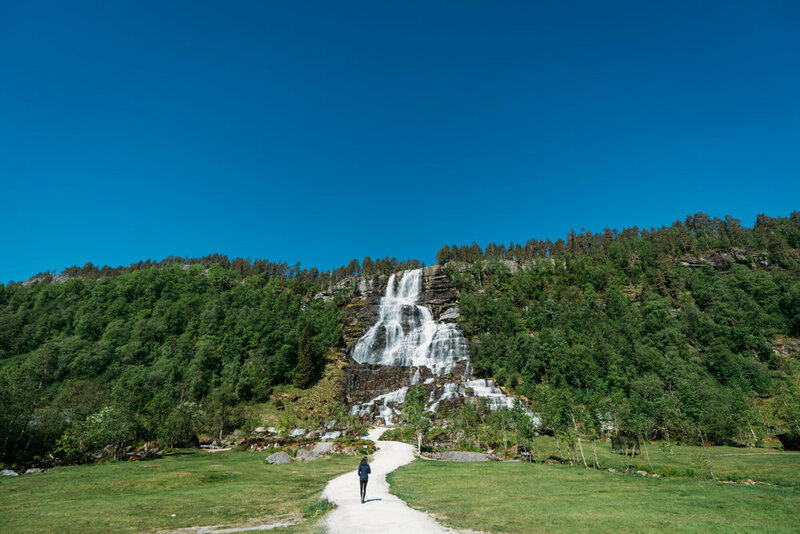 May and early June is the best time of year to go if you like chasing waterfalls - the snow melt from a long winter leaves them flowing all over every nook and cranny of the country.